Home » October Unprocessed Posts » Food For Thought » So you want to be an Urban Farmer? Not a crazy idea these days. So you want to be an Urban Farmer? Not a crazy idea these days. Quick Tip: Growing your own food and running a Farmers Market make October Unprocessed pretty much a breeze! Diet Coke is my only nemesis and I’m winning that battle (thank you soda stream and freshly made fruit juice). What a crazy year it’s been. During October Unprocessed 2011 I was working in a box within a box, staring at two computer screens, sending email all day. Oh yeah and that 3-4 hour commute through the worst of LA traffic. It was a great job with a great company, but after 12 years working in Hollywood I found myself in a world that had changed rapidly. I had lost almost all of the passion and drive for filmmaking that had powered me through that crazy world. I was no longer walking the right path and felt lost. Not just lost, but trapped. My escape…learn to grow my own food. It boiled down to a dependency on a salary to purchase the basic fundamentals of survival, most basic, food. Naively I started planting improvised containers in September of last year and in that simple act stepped onto a new path. Long story short, I became hooked on the concept and practice of Urban Agriculture. Suddenly all the open spaces that I encountered were evaluated for their potential to grow food. All flat spaces at home were checked for sun coverage. In a couple of weeks we were eating our own lettuce and tomatoes and there was no turning back. It was also a year ago that I moved from Venice (California) to North Long Beach. Unwittingly I had dropped right into the middle of an incredibly vibrant community of people looking for new ways to live and work with each other. To my surprise and joy I also discovered a fully functioning urban farm less than two miles from my house. The Growing Experience is a collaborative effort between the Los Angeles County Housing Authority and several philanthropic supporters. 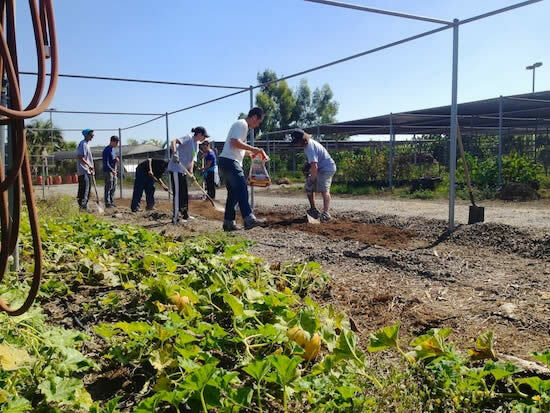 Located on seven acres within the Carmelitos Housing Community in North Long Beach, it was started as a nursery to supply LA County landscaping projects. In 2008 Jimmy Ng took it in a new direction and developed a sustainable farm and orchard program. After four years The Growing Experience supports a vibrant CSA program, provides produce to local restaurants, and has just started a weekly onsite Farmers Market (Saturdays 10am-2pm). They have four acres under intensive crop production and three acres of developing orchard with topical fruits, citrus, figs, and avocado. 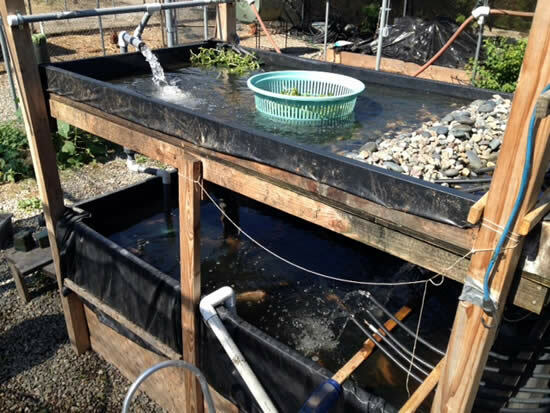 They also have chickens for fresh eggs and an aquaponics setup that is currently raising Tilapia (below) and Watercress (above). 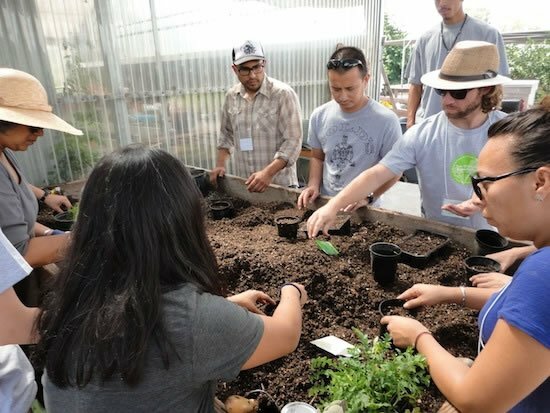 Looking to extend all he and his small staff have learned, Jimmy, partnering with the LA County Community Development Foundation, developed a program to train residents in urban farming and to incubate a number of small Urban Ag businesses. The Business Trainee Program (BTP) brings together residents of the Carmelitos Housing Community and several Long Beach residents for one year with the goal of launching several businesses by September 2013. I am honored to be included in the inaugural class. The program structure is designed around working on the farm to ground our business ideas in the reality of producing food for market. The business planning and execution are as important as the farming skills in the overall program structure. We are beginning with the basics of Urban Agriculture by building test beds in which we will grow produce for the CSA. These beds will be intensively planted and we will be collecting detailed data on our production. At the same time we are working with indoor propagation techniques and are growing seedlings to fill the test beds in a few weeks. The new year will be the time for us to start focusing on our individual or group business. Planting for spring harvest will drive some of us, but all of us will be working hard on business plans with the guidance of experts from Wells Fargo, University of Southern California, University of California Extension, and local business advisors. 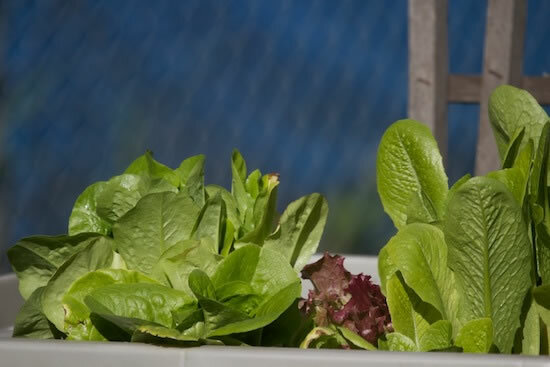 We will be focusing on the peculiar economics of Urban Agriculture, including intensive organic cultivation, storage, local distribution, marketing & developing new markets, and non-traditional financing & fundraising. Summer will see us in full production and extending the current CSA program to new subscribers. We will also be applying for our business licenses, which is the final requirement for the program completion. We have a long way to go, but I’m extremely excited and honored to be included in this incredible and unique opportunity. You can follow my journey on my recently launched blog, The New Market Gardener. Come and visit me at the Greener Good Farmers Markets in Long Beach on Wednesday afternoons in North Long Beach and Saturday mornings in West Long Beach. If you are interested in learning more about the Growing Experience or becoming a CSA subscriber you can contact Jimmy Ng at Jimmy.Ng[at]lacdc[dot]org. It’s open to the public so you can stop by anytime Monday through Friday, 9am-6pm, 750 Via Carmelitos Long Beach, CA. Brownsville Student Farm – A great farm project in NYC. I helped fund their Kickstarter campaign. The Essential Urban Farmer & Ghost Town Farm blog – Novella Carpenter’s horrible and wonderful journey inspired me to action locally. Wanna get really pissed off at stupid people getting in the way of good work and progress, read Novella’s blog. 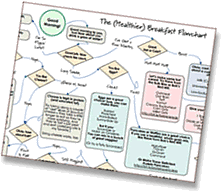 Her new book, written with Willow Rosenthal, is the best starting point with tons of information bred from hard work and experience. Mother Earth News – Wanna know anything about farming or gardening? Here’s the source. SPIN Farming – Need a business model for growing small plots, the SPIN method was designed specifically for urban farmers. Realtime Farms – Wanna know where your food comes from? Check this amazing site out. Local Harvest – Find markets, farms, CSAs, anything local food. Jim Conrads grows wine grapes and raises heritage livestock at Blue Oaks Farm and Latrobe Vineyards in the Sierra Nevada foothills at the heart of the Motherlode Gold Country. He comes to farming from Hollywood, having spent his first career running Post Production on big movies, then developing talent at DreamWorks Animation. If you would like to learn more check out the Blue Oaks Farm Facebook page, Website, Instagram, or better yet, come by for a visit! Thank you, Jim. I find this idea fascinating! I’ve never been a gardener, but would love to start a small garden in my backyard next spring. I have much to learn. For two summers now we’ve had a garden. Tomatoes, kale, spinach, onions, jalapenos, strawberries, herbs, lettuce….I LOVE it. Yes, it’s a lot of hard work. But the food I grew tasted a million times better than anything I buy in the store. It’s pretty much ruined store-bought veggies for me. Great resources, thank you! I love our CSA, but after an admittedly half-assed first shot at gardening this summer, I’m looking forward to trying some cool-weather crops (thanks, SoCal) this fall and winter.